Honeywell has a new Minneapolis Skyway Maps app. I haven't used it yet, but I downloaded it and will give it a try. This example is for fire evacuation, but I don't see why it couldn't be applied more generally for interior navigation. I think it was done with Apple's ARkit. We're still at the very beginning with AR. I think the possibilities for overlaying data on a live picture of the real world are enormous. Minneapolis has the largest skyway system in the world. I'm curious what we could achieve if we further embraced with the goal of producing a 24/7 "City in the sky," and all the economic and quality of life benefits that come with it. We need some goals and leadership to fully unlock the benefits of this asset. I know the skyways aren't always popular, but our weather isn't great and they're safer than the street level and a very effective means for those with disability and seniors. That's pretty cool, but it doesn't have the entire system. To make it usable it really needs all the Skyways. Spotted this new sign today. The skyways along Nicollet are PACKED tonight. Lots of traffic but not a lot of retailers open to take advantage of it. It's interesting to see which places decided to open up and which didn't. For example, the little tea shop in 811 LaSalle was open, and was the only thing in that building. Didn't look like it was really worth their while. Did they realign the skyway through the old Barnes and Noble? It was always so strange to me how that area worked. Yes. They removed the old escalators down to the street level and redirected the hallway around towards Nicollet to pass by four or five smaller retail spaces where BN used to be. Then there's a new set of escalators approximately where the BN escalators were, so you still have to go down to street level to get to the Medical Arts building and the Metro. Probably the same ones, no? They're rotated 180° from the old ones. I don't know if they would have taken out and reinstalled the old ones - I guess it depends on what condition they were in. 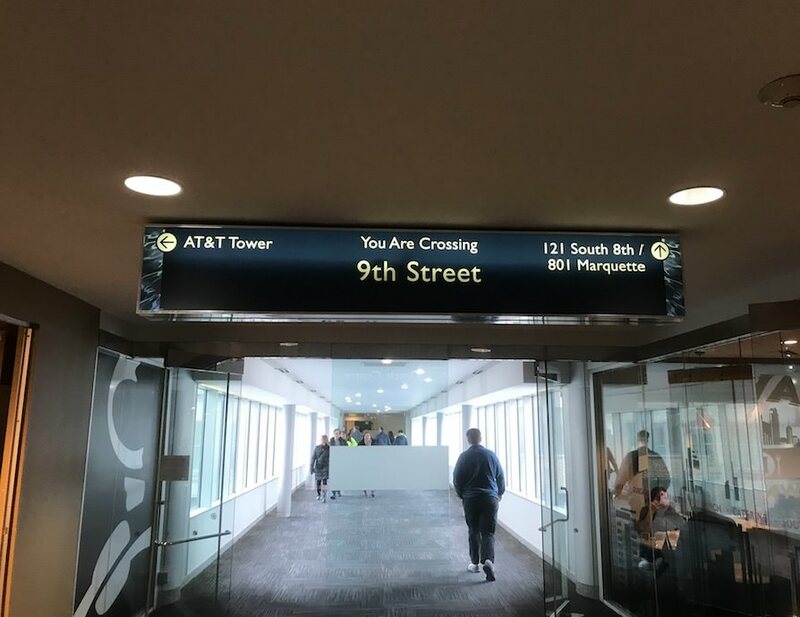 I've seen the new highway signage I posted previously now spread to other buildings. Is this the new standard? Yes, it's a slight update from the old signage meant to be more readable and replace existing signs. But it's not meant to be a reinvention of the signage system. Hopefully that will happen at some point (my wish). Hopefully that will happen at some point (my wish). Probably won't, that would mean Steve Cramer would have to do more than the bare minimum. There has been talk in many different threads about the skyways and how people use them. Even with temps seasonably warm, they are promoting the path from ABC to US Bank Stadium. it'd be easier to jump on the light rail. be easier to uber it. What, right after a Vikings game? You'd be waiting a long long time.